Born Marguerite Johnson in St. Louis, Missouri in 1928, she received the nickname “Maya” from her brother Baldwin. At the age of four Maya and her brother were sent to live with their grandmother in Stamps, Arkansas. A couple of years later they moved back to St. Louis to live with their mother, but were soon returned to Stamps after Maya was molested by her mother’s boyfriend and turned mute. After her return to Stamps Maya Johnson began to read voraciously and listen intently to everything that happened around her. By high school, her voice had returned. Johnson, then 15, and her brother were reunited with their mother who was now living in San Francisco, California. One year later she graduated from high school while pregnant. In the years after her son, Clyde, was born Johnson worked variously as cook, dancer, driver, and singer. She was also married briefly in 1952 to Anastasios Angelopulos, a Greek sailor. In 1954 Johnson became a professional actor when she joined the traveling production of Porgy and Bess. She adopted the name Maya Angelou by combining her nickname with a shortened version of her ex-husband’s last name. After visiting 22 countries for performances, Angelou quit the show after her son became ill. She and Clyde returned briefly to San Francisco but then moved to New York City where she joined the Harlem Writers Guild to hone her writing skills. In 1960, Angelou left the United States to reside briefly in Cairo, Egypt with her new husband South African freedom fighter Vusumzi Make. While abroad, she learned to speak French, Spanish, Italian, Arabic, and the West African language Fanti, fluently. The couple soon separated and Angelou moved to Ghana. While there, she befriended former of Nation of Islam leader Malcolm X on his visit to Africa and embraced his black nationalist philosophy. 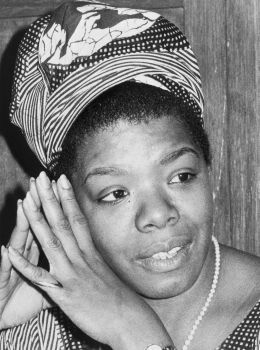 Angelou returned to the United States in 1964 anticipating helping Malcolm X develop his new Organization of African American Unity (OAAU). However, Malcolm X was assassinated in March 1965 and the OAAU dissolved. Angelou continued to participate in the black freedom struggle, working with Dr. Martin Luther King, Jr., and serving as the Northern Coordinator for the Southern Christian Leadership Conference until his assassination in 1968. At the age of 38, at the urging of James Baldwin, Angelou began writing a series of autobiographical books including I Know Why the Caged Bird Sings (1970), her most famous work, as well as Gather Together in My Name (1974), Singin’ and Swingin’ and Gettin’ Merry Like Christmas (1976), The Heart of a Woman (1981), and All God’s Children Need Traveling Shoes (1986). In 2002, she authored A Song Flung Up to Heaven and in 2008 she narrated the award-winning documentary The Black Candle, and published a book for young women, Letter to My Daughter. Angelou also appeared on television and in movies including the highly acclaimed television miniseries, Roots (1977), Poetic Justice (1993), and Tyler Perry’s Madea’s Family Reunion (2006). In 1996 she directed her first full length feature film, Down in the Delta. Angelou has received numerous honors and awards for her lifetime of achievement. In 1971, her book of poetry, Just Give Me a Cool Drink of Water ‘fore I Die, earned her a Pulitzer Prize nomination. She also became the first black woman to recite poetry at a presidential inauguration (William Jefferson Clinton, 1993) and only the second poet (after Robert Frost at the John Kennedy inauguration in 1961), to be invited to participate in an inauguration. In 2000, Angelou received the Presidential Medal of the Arts and in 2008, she received the Ford’s Theatre Lincoln Medal. On February 15, 2011, President Barack Obama awarded Angelou the Presidential Medal of Freedom at a White House Ceremony. The Medal is the nation’s highest civilian honor. In 1981 Angelou became the Reynolds Professor of American Studies at Wake Forest University in Winston-Salem, North Carolina. She continued to lecture and write until her death. Maya Angelou died in her Winston-Salem home on May 28, 2014. She was 86. Darryl Lyman, Great African American Women (Middle Village, NY: J. David, 1999); L. Patrick Kite, Maya Angelou (Minneapolis, MN: Lerner Publications, 1999); http://www.mayaangelou.com; http://poets.org, New York Times, May 29, 2014. Darryl Lyman, Great African American Women (Middle Village, NY: J. Publications, 1999); http://www.mayaangelou.com; http://poets.org, New York Times, May 29, 2014.